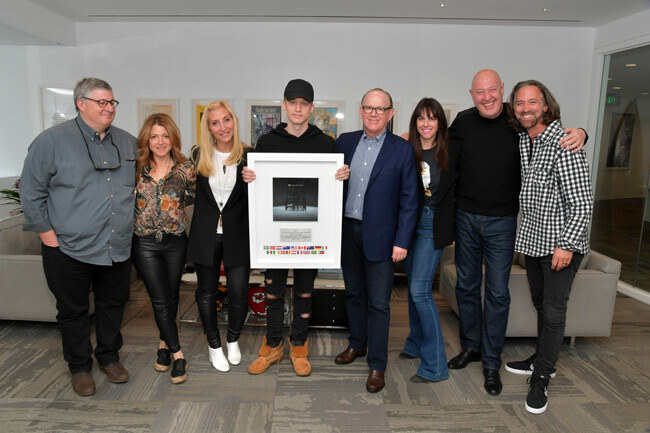 While NF was in Los Angeles yesterday for his sold-out show at The Wiltern, Capitol Music Group (CMG) Chairman & CEO Steve Barnett surprised him with a plaque to commemorate 1 million global adjusted album sales. This impressive number includes 125,000 albums, 750,000 track downloads and over 1 million combined streams of the NF Real Music/Caroline U.S. gold Album Perception and the U.S. platinum single “Let You Down.” The celebration at the Capitol Records Tower was made sweeter by the simultaneous move of “Let You Down” to the No. 1 position on the Mediabase Top 40 chart. "Let You Down" has served as a gateway for countless new fans to experience NF's third full-length album, Perception (Caroline), which bowed at #1 on the Billboard Top 200. Upon arrival, it sent shockwaves throughout the culture at large as chronicled by Forbes, Billboard, New York Times, Rolling Stone, and many more. Capitol Music Group (CMG) is comprised of Capitol Records, Virgin Records, Motown Records, Blue Note Records, Astralwerks, Harvest Records, Capitol Christian Music Group, Priority Records, Atom Factory, and Deep Well Records, as well as Capitol Studios and the company’s independent label services and distribution division, Caroline. Capitol Music Group is based in Hollywood, California in the iconic Capitol Records Tower. For more info on NF, visit the JFH Artists Database.